Funny Typing is a cute small program that certainly makes typing a more fun activity. It helps you hear a distinctive sound each time you pressed your keyboard and mouse. 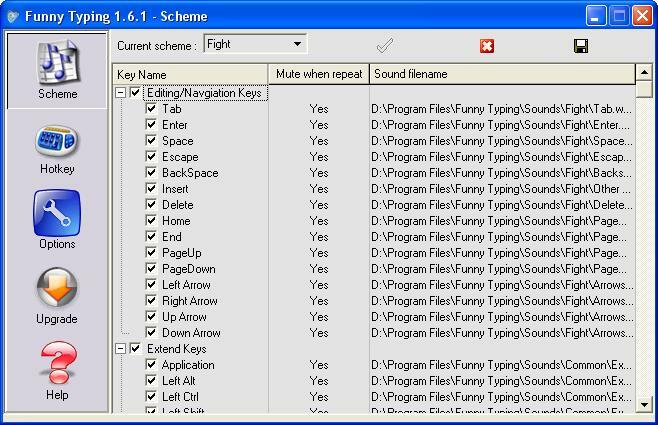 Built-in 12 sound schemes for choose Typewriter sounds, Fighting sounds as Hollywood films, Gun sounds as war games, Abe, Mix, each scheme assigned to all key events. It makes your typing not boring any more. When you press the keys, you will hear a fancy sound which is made by the Funny Typing. The key layout is very exquisite, more than extremely cool 140 sounds effect associated with 18 kinds of keys.Funny typing can play an animation synchronously to respond to your every action when you press keys. Everything is under your control!Own it, you can experience exciting and completely avoid the baldness of thesoundless keyboard! Hereafter, you can enjoy the PC typing world.That's it. Have fun! * Choose from among 12 built-in sounds. Contains 12 sound schemes for choose--Typewriter,Typewriter2, Fight, Gun, Abe, Mix, each scheme assigned to all key events. Some are classic typewriter sounds, others are subtle short clicks, beeps, and boops, while others are more attention-getting and might be appropriate. e.g multi virtual clipboard, quick shutdown, volume control and quick restart tools. * Heard and not seen. No advertising splash screen and nothing in the Windows "tray" to clutter your screen. It has an extremely easy to use interface that requires no technical knowledge whatsoever. The installation takes less than 10 seconds, and even a non-technical novice can get Keyboard Sounder up-and-running in minutes.